A mention of SPAM — the pinkish canned pork product produced by Hormel Foods — generally results in either a smile or grimace. Kay was born in Austin, Minnesota, the home of SPAM, and is in the latter camp. David spent several years in the Boy Scouts and retains fond memories of the savory meat sizzling in a small skillet over a can of Sterno. While SPAM continues as the subject of jokes, it remains serious business at Hormel’s corporate offices. So much so that the firm honors SPAM with its own hometown museum. The first was relatively small and opened 25 years earlier in the town mall. This was replaced 10 years later by a considerably larger museum in a downtown store. The most recent version is in a modern newly constructed corner building in downtown Austin. Through the years, we have visited all three. We arrived at the new museum on a September afternoon and met museum manager Savile Lord, who introduced us to SPAMbassador Steve Nordrum. We had called ahead and requested a guided tour so as not to miss anything and, perhaps, collect some interesting tidbits of information. Visitors can choose a guided tour or stroll the museum on their own. Each is free. The museum’s 14,000 square feet is separated into eight topic areas plus a gift shop. We first explored ‘Can Central’ with numerous touch screens, quizzes and puzzles. Three screens offered hundreds of SPAM recipes for breakfast, lunch and dinner. Selected recipes can be emailed. Green eggs and SPAM, anyone? Next was an area offering a review of Hormel’s history. Founder George Hormel established the company in 1891 and later expanded its operations to additional locations. Son Jay added creative touches such as cooking meat in a can while still on the assembly line — the first processed hams. The product required no refrigeration, a major plus at a time when few households owned refrigerators. During the Depression, Jay headed up the development of a meal in a can — Dinty Moore Stew. SPAM followed shortly thereafter when the firm cooked smaller servings of meat, 12 ounces, in the can. Strolling to the ‘Supporting Our Troops’ area, Kay located her uncle’s name listed with World War II veterans who worked for Hormel prior to the war. Each was guaranteed his or her job back following service to our country. In this section, we learned SPAM was a food staple not only for our troops, but also for Russian and French soldiers. Difficult to imagine the French eating SPAM, but that’s what it said. 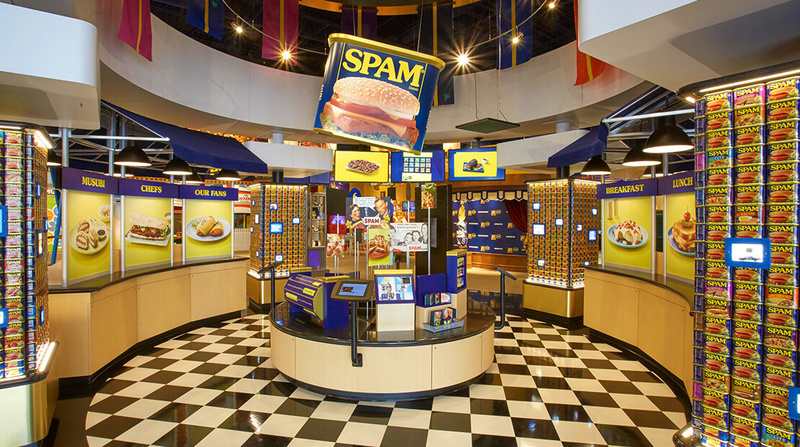 At frequent intervals, a SPAMbassador walked through the museum with trays of SPAM samples. Each time it was a different variety and with 15 varieties we felt investigative journalism required sampling offerings from each tray. The ‘World Market’ area includes a large touch-screen on which we called up interesting facts and film clips about countries where SPAM is sold. Individual booths highlight specific countries including the U.S. where residents of Hawaii consume more SPAM per capita (six cans per man, woman and child each year) than residents of any other state.